KitMonsters – DEM. The music makers’ guide to making music. 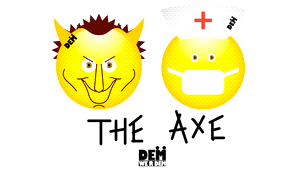 DEM are a groundbreaking duo and we are excited to premiere the cartoon video for their first release ‘The Axe’, a protest against cuts to the National Health Service in the UK. DEM create stripped-back ear-worm songs with bass heavy grooves and punk, reggae, and pop influences. They have also released their track in Augmented Reality using the Traces app. DEM are Ava Butcher - Bass, Vocals, FX, and Jaq Jones - Drums, Vocals, FX. The Axe is DEM’s powerful debut, clearly staking out their territory making cutting and cutting edge protest music. The song is deceptively simple, a story of someone trying to get to see their doctor, and finding an NHS in trouble as the Axeman is coming. The track wedges itself in your brain thanks to the bass groove and catchy chorus. The duo’s stripped down sound revolves around bass, a drum kit and some effects pedals. At the core of the video are custom Emoji, illustrated by London’s Yuko Sugimoto AKA Ucotopia. We had to make our own Emoji, we call them DEMoji. We even got some London street animals, rat, grey squirrel and mono legged pigeon. The video includes stick figure versions of politicians David Cameron, Boris Johnson, Theresa May and Jeremy Hunt, with Hunt being the Axeman. It also references stories in the papers about an overworked NHS, the closures of GP surgeries and A&E depts, and the growing concern that the UK is moving towards a USA style private medical care system. We’re not really political but we can’t just sit and watch. We want to bring people together. We are a people, we are DEM. 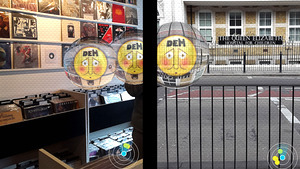 DEM also ventured into Augmented Reality for their release, taking inspiration from Banksy whose political art works are placed on location. 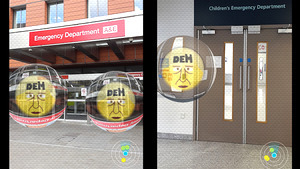 They collaborated with Traces - it’s a top-rated app that lets people leave and find digital content using geolocation and Augmented Reality (AR). It enabled DEM to place ‘The Axe’ in its creative context. DEM Traces or DEMbubbles (as DEM call them) float in mid air, once ‘popped’ they reveal the Bandcamp download link for the tune. 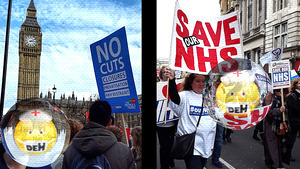 They launched the AR version of ‘The Axe’ along the route of the #ourNHS demonstration that saw 250,000 people protest in central London in March. People loved what they saw and wanted leave their voices as well so a trail of Traces were added to the route documenting the demonstration. Anyone with the Traces app can find and pop these bubbles. 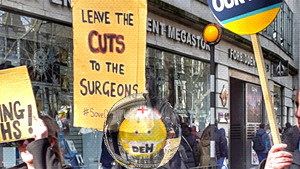 DEMbubbles containing ‘The Axe’ are also found floating at London hospitals several of which reveal additional personal stories spoken by DEM, and people are invited to leave their own voice of gratitude and support for the NHS. This immersive experience allows the audience to engage in a fun and innovative way. It also allows people to become part of the Art rather than simply consuming the music. And this is an important subject, so the project champions the People’s voice. DEM’s Ava Butcher talked us through her bass and effects set up. My Warwick Corvette is my workhorse. It’s so versatile and responsive I can get any sound from it. It’s got a natural growl which people always comment on. The pickups can be switched to work in serial, parallel & single coil modes. The bass is active/passive, I normally play it in passive mode it’s great to have the option though. 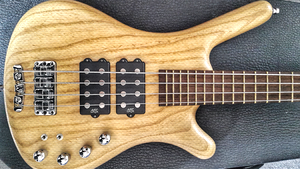 This bass has impressed people who don’t normally like the sound of Warwicks. I’m quite lucky to have that bass. Ava’s also a fan of Source Audio’s Hot Hand range. I use both the Hot Hand USB and Hot Hand 3. 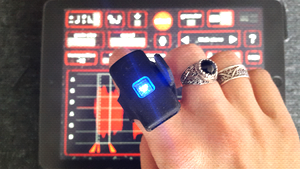 The Hot Hand USB is used to send MIDI messages to my iPad or DAW. It’s a very cool way to add automation such as filter sweeps during mixing or manipulating effects during performance. Instead of twisting knobs and pushing sliders I can move my hand in various directions. It’s got three axes which I’ve calibrated and assigned to various controls via a little configuration app. 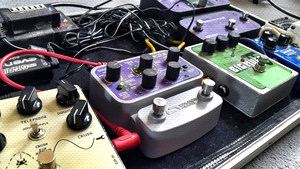 The Hot Hand 3 is used with my Source Audio Manta bass pedal. By moving my hand I can send data to the pedal and change things like volume, speed of LFO, filter sweeps. I’m always looking at new ways to use this technology I love it. It’s a really simple version of Imogen Heap’s controller gloves. Those are amazing!